Project obstacles and solutions: In 2009, Lojac Enterprises was awarded a 10,000 cubic yard patching project on Interstate 440 in Nashville, Tennessee. Effective October 2008, the Federal Bridge Law (FBL) was applied to all federal highway projects in Tennessee. FBL limits the weight of a standard four-axle mixer to 6.5 yards and a standard rear-discharge mixer to 5.4 yards. This greatly increased the number of trucks used and fuel consumed to complete a highway project. It raised the cost of the project and threatened to extend the time needed to complete it. IMI introduced twelve six-axle mixers to its Tennessee fleet to combat this issue. By using 6 axle mixers, IMI was able to deliver 9.25 yards per truck and still meet the FBL compliance. To date, IMI is the only concrete company in Tennessee using 6 axle mixers. "IMI always finds a way to get things done," states Donald Looney of Lojac. “IMI’s six-axle mixers were perfect for the project. We had time sensitive lane closures and significant potential fines in place if the pours lagged. Being able to deliver 9.25 yard loads instead of 6.5 or fewer saved everyone time, money and headaches. They provided us with a huge advantage on this project and will on future projects as well." 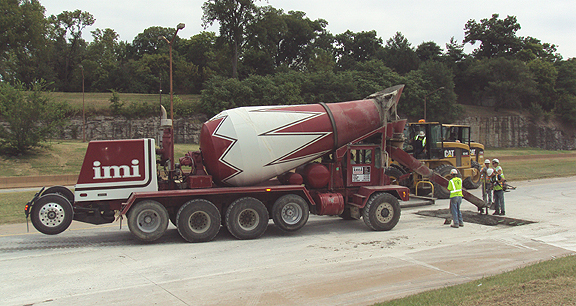 The six-axle mixers do several things that are positive for Tennessee construction. They are more efficient to operate. They carry 70 percent more than a rear-discharge mixer and 40 percent more than a standard four-axle front discharge mixer. That saves tax dollars on highway projects. Since they carry more concrete, they help speed up the construction scheduling process, thus reducing down time and lane closures. There are fewer mixers on the road. That cuts down on congestion, keeps our roads safer and lowers fuel emissions into the air. They also bring your construction project into compliance with the FBL without hampering your construction schedule. If you are found to be in violation of the FBL, there are serious consequences. You can be fined by the state Department of Safety, loads can be turned back and rejected by the DOT, and you can forfeit payment for non-compliant work. For more information on the FBL load compliance, click here.